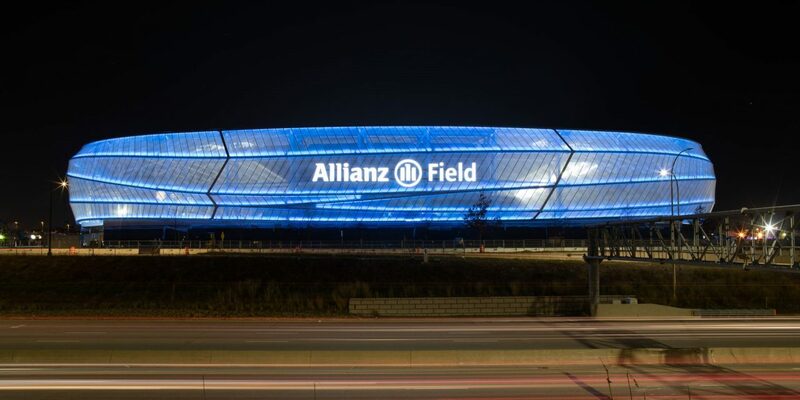 Allianz Field officially opens in mid-April, but the newest Major League Soccer stadium made its presence felt in December when the LED roofline turned red and green to celebrate the winter holidays. 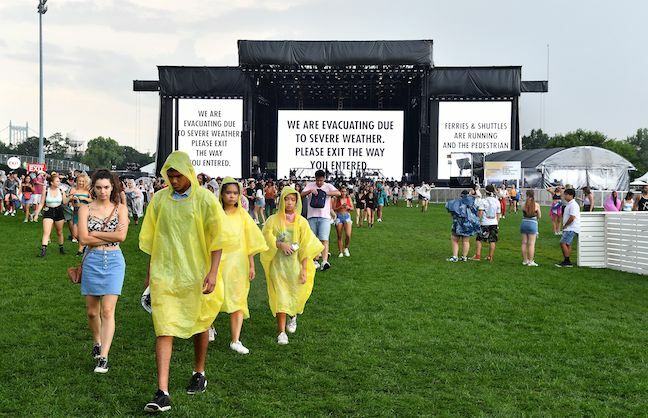 The festive beacon caught the attention of thousands of motorists on Minnesota’s busiest highway and gained the venue exposure across social media. The roof canopy’s ability to change colors for events is the signature feature at the $250 million facility, which sits off Interstate 94 in St. Paul’s Midway neighborhood, the halfway point between the downtowns of St. Paul and Minneapolis. On April 13, when Minnesota United FC plays its first home match in MLS, the roofline will turn a cool blue. Populous designed the stadium, but Dr. Bill McGuire, former CEO of UnitedHealth Group and Minnesota United FC’s principal owner, knows a little bit about architecture. The William and Nadine McGuire Theater, named for him and his wife, is part of the Walker Art Center in Minneapolis. Swiss architect Jacques Herzog designed the theater, and his firm developed Allianz Arena in Germany. That stadium, home of German pro soccer powerhouse FC Bayern Munich, opened in 2005 with an illuminated roof similar to Allianz Field. McGuire got to know Herzog through the theater project, and later through research on soccer stadium design he became familiar with the “family” of seven existing venues named for Allianz, the German financial services company. St. Paul’s new stadium stands apart in some ways from the other Allianz-branded soccer facilities, according to McGuire. The roof canopy was designed to capture the spirit of Minnesota’s natural resources, notably the Mississippi River and the state’s abundant lakes, plus the northern lights, project officials said. 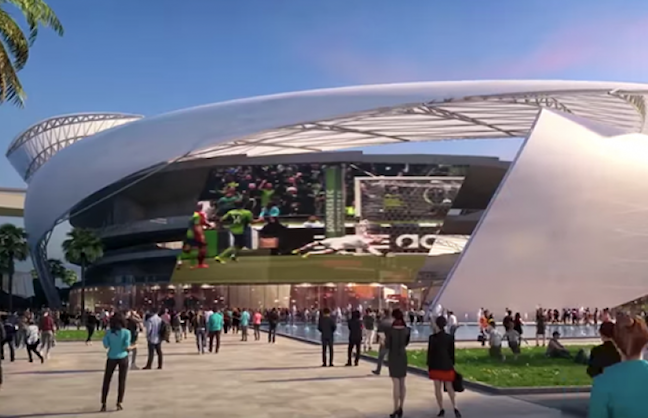 “We call it the flow concept, which is really reflected in the architecture with the most recognizable piece of the building,” said Bruce Miller, a senior principal with Populous and a designer of multiple MLS stadiums. 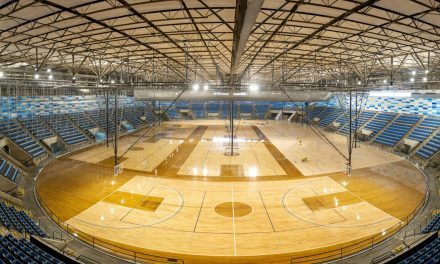 The roof canopy also fills a critical role for protecting fans from harsh Minnesota winters, which often start in October and extend well into April. Hometown contractor Mortenson hustled to get the exterior work completed last fall so it could move indoors to finish interior spaces as temperatures dropped and snow flew. Several weeks before the opening match, the roof is doing its job, Miller said. MLS teams in Vancouver and Atlanta both play on artificial turf in stadiums with retractable roofs. In Minnesota, from the start, the team committed to playing soccer on natural grass in an open-air building, McGuire said. The team paid attention to weather-related issues, though, which drove the design of public spaces revolving around food and merchandise. Four retail stores are distributed in the corners of the facility, including the 2,150-square-foot main location in the northwest corner. They’re all walk-in layouts to give fans a break from the cold during a long season that kicks off in March and ends with MLS Cup in December. In addition, Delaware North Sportservice, the stadium’s food provider, has three grab-and-go outlets for fans to warm up during soccer matches and other events. Fanatics runs the stadium merchandise. The team’s popular loon logo, recognizing Minnesota’s state bird, drove the decision to add a fourth store late in the design process. One website that does analysis of all soccer team logos ranked Minnesota United FC’s brand No. 14 worldwide, and it’s the highest of all MLS teams, team CEO Chris Wright said. There’s no question about the demand for premium seats at Allianz Field. The stadium’s 19 suites, 19 loge boxes and 1,400 club seats, all built on the west side, have wait lists after selling out, Wright said. Club seats for the Upper 90, the most exclusive ticket in the building, which is reserved for 90 patrons, cost $4,500 a person for the season. The remaining club seat options are priced at $1,400 to $3,500 a person for the season. Suites cost $80,000 to $120,000 per season for multiyear deals and come with 16 fixed seats. Loges, split into groups of four and six seats, run from $18,000 to $25,000 for the season. Separately, three party suites cost $7,500 to $10,000 as a single-game buy. Minnesota United FC sold all the premium inventory in-house after hiring CSL International to conduct market research to determine the right mix of premium seats. In early 2018, the team reached its cap of 14,500 season tickets sold. The stadium’s 19,400 fixed seats includes a supporters section in the south end that holds 2,920 fans. Apart from premium, a brew hall serves as an “everyman’s club” off the main concourse on the stadium’s north side. It’s open to all fans. The centerpiece of the 5,800-square-foot room is a bar stretching 90 feet with 96 taps serving a bevy of craft beer selections. The large glass doors framing the entrance were designed to pivot upward to create an indoor-outdoor feel and expose the bar to concourse traffic, Miller said. The 250-person roof deck that sits on top of the brew hall is reserved for group sales and single-game ticket buyers. In the upper Midwest where residents like to squeeze in every bit of summer glory, the roof deck experience is a popular feature at Twin Cities bars and restaurants. On days when games aren’t played at Allianz Field, officials see the brew hall and the roof deck becoming the place to watch Minnesota sports in the summertime. $4 million annually, an agreement that gives Minnesota United FC access to the network of stadiums branded for the company. Allianz already has a strong presence in Minnesota, Wright said. Bell Bank and Element Electronics sponsor two of the stadium’s four gates with deals valued in the seven figures annually. Bell is the 16th-biggest privately held bank in the U.S. and has aspirations of becoming No. 1 over the next 10 years, which coincides with the term of its agreement at Allianz Field, Wright said. All told, Minnesota United FC officials expect the team to rank among the top five in MLS for sponsorship revenue for the 2019 season, he said. In a competitive market for special events, the team will take it slow this year, McGuire said. Allianz Field does have a sold-out CONCACAF Gold Cup doubleheader set for June 19, featuring the U.S. men’s soccer team. In addition, the stadium will play host to an NCAA Division III college football game Oct. 19 between two in-state rivals, the University of St. Thomas and Saint John’s University. The game sold out in a few hours. Two years ago at Target Field, St. Thomas beat Saint John’s in the first football game at the Twins’ ballpark.